I spent this past summer conducting field research in Bwindi Impenetrable National Park, one of the only remaining areas in the world where one can safely observe the Grauer’s Broadbill (Pseudocalyptomena graueri), also known as the African Green Broadbill, endemic to the montane forests of the Albertine Rift. The Albertine Rift is a mountainous region in East Africa formed by the splitting of the Somali and African plates. Owing in part to its long evolutionary history, diversity of habitats, and steep elevational gradient, it is the most biodiverse region in Africa. The region supports more vertebrate species than anywhere else on the continent (Plumptre et al. 2007) including nearly 50% of Africa’s bird species, many of which are endemic and globally threatened (Carr et al. 2013). Because to this diversity, the region has been identified as a top priority area for biodiversity conservation (WWF 2016) and is thought to be one of the most vulnerable regions on the planet due to human-caused environmental changes (Carr et al. 2013). Grauer's Broadbill. Photo Credit: Michael Todd. Bwindi Impenetrable National Park (BINP) in southwest Uganda is a 331 square km area of protected montane forest supporting an incredible diversity of species and habitats including over 380 species of birds, 120 mammal species, and half of the world’s critically endangered Mountain gorilla population (Plumptre et al. 2007). In 2002, avian diversity was characterized by the Wildlife Conservation Society across the Albertine Rift, revealing higher species richness and the presence of more endemic and threatened species in BINP compared to other forests in the region (Plumptre et al. 2012). I was there to generate new rigorous estimates of avian diversity and to examine the relationship between bird communities and habitat along elevational and disturbance gradients. One major predictor of species extinction risk, particularly in the tropics is having a limited elevation range (Harris & Pimm 2008; Lee & Jetz 2011). This is concerning given that approximately 30% of the world’s threatened bird species are restricted to narrow elevational ranges in montane regions (Jankowski et al. 2013), yet, determinants of species elevation ranges, however, are still poorly understood. One mechanism proposed for elevational specialization for tropical montane species includes physiological constraints due to narrow thermal optima (Janzen 1967; Colwell et al. 2008; McCain 2009). However, biotic factors are also important and vegetation heterogeneity and productivity, which varies along elevational gradients and with disturbance, has been shown to be positively correlated with avian species diversity (MacArthur & MacArthur 1961; Terborgh 1977; Rahbek 1995). Downscaled climate models predict continued warming and declines in precipitation for lower elevations coupled with increased precipitation and cooler temperatures at higher elevations (Phillipps & Seimon 2010), potentially reducing the elevational ranges of many species. Alternatively, or in addition, in the absence of biotic constraints (e.g., competition or specialized habitat requirements), species should be able to maintain their climate niches by moving relatively short distances up or downslope. However, if habitat requirements, specific to an elevational range, constrain species beyond their physiological limitations, such species should be more vulnerable to changing climate. In either scenario, this shrinking of species ranges or reshuffling of avian communities would potentially lead to a disruption of ecological networks and new species interactions, accompanied by changes in abundance for many species. For this reason, understanding what factors determine species’ elevation ranges is necessary to predict how those species will respond to anthropogenic change, including climate and land disturbance. One of Albertine Rift’s most range-restricted and vulnerable species is the Grauer’s Broadbill. This rare little bird has been a coveted species for birders and ornithologists since it was first collected in 1908 in the Democratic Republic of Congo by Rudolf Grauer, a naturalist from Australia. The first account of its discovery read, “the tropics are full of birds that are green, but this was different” (Rockefeller & Murphy 1933). Prior to its second discovery in 1929, Sterling Rockefeller and Charles Murphy wrote “It was an object of envy among naturalists, yet none of the collectors who had visited Kivu were able to find a single individual.” Still today, avid birders flock to this region in hopes of glimpsing one of these special birds and only few are lucky enough to do so. Occurring only in the Itombwe Mountains and Kahuzi-Biéga National Park of the Democratic Republic of Congo and BINP, the Grauer’s Broadbill is listed as vulnerable by IUCN due to its limited distribution coupled with fragmentation and deforestation throughout its range. Recent surveys have been unsuccessful in locating the species in Kahuzi-Biéga National Park (A. Plumptre in litt. 2007; BirdLife International 2016) and although the species has been reported to be more common in the Itombwe Mountains, the region is unprotected. The current population trend is thought to be decreasing, however, rigorous quantitative assessments of population size have yet to be generated and extinction risk is unknown. The Grauer’s Broadbill is small in size (~13.6–15.6 cm and 29–32.5 g), predominantly bright grass green in color with a varied pattern of pale blue on the chest and throat, ear coverts, and under the tail. Adults have a black-streaked buff crown with a narrow black eye stripe. In foliage, its coloring provides exceptional camouflage, but in direct light it’s a striking little bird. Little is known about its breeding behavior but birds are in breeding condition in July and August, and one active nest was observed in April. The species forms dome nests made of lichen and mosses, generally suspended in the outer branches at about mid-canopy height. Observational accounts from Kahuzi-Biéga National Park and the Itombwe Mountains of DRC and BINP suggest potential ecological differentiation between the populations (Friedmann 1970). In BINP, it prefers forest edges and isolated trees in open areas and has been found between 1,760 and 2,480 m in DRC and between 1,060 and 2,285 m in Uganda. In Uganda, the species is often found in the upper portions of the understory in stands of Chrysophyllum gorungosanum. In DRC, however, it is found predominantly in the upper canopy below the bamboo zone, favoring areas of dense foliage along forest edges and near cultivation. Despite its status as a rare, endemic and vulnerable species, specific habitat requirements, behavior and demographic parameters are still largely unknown. Originally thought to be a flycatcher (Lowe 1929), it has been observed gleaning insects from foliage or catching them in the air (Rockefeller & Murphy, 1933). Unlike other eurylaimids, individuals have also been seen moving like woodpeckers along the undersides of horizontal branches (Bruce 2018). The stomach contents of five specimens revealed small beetles, snails, insects, insect larvae, seeds, flowers, buds and fruits (Friedmann 1970). It has been observed foraging singly or forming multi-species flocks of up to ten birds (del Hoyo et al. 2003), a behavior common to many tropical insectivore species (Bruce 2018). The most common explanations invoked for this behavior are protection from predators and increased foraging efficiency (e.g., flushing insects) coupled with reduced competition with conspecifics relative to heterospecifics (Terborgh 1990; Beauchamp 2004; Darrah & Smith 2014). These mixed flocks can be very specific in their composition, but this has yet to be studied for the Grauer’s Broadbill. 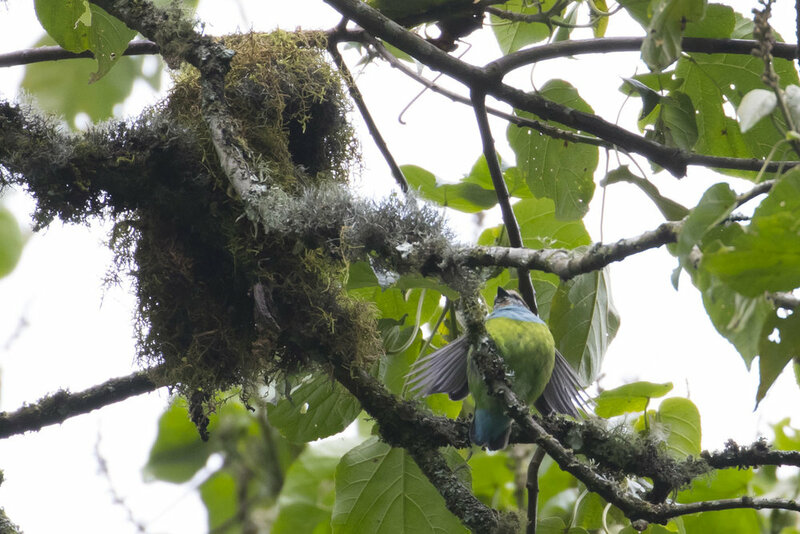 While doing point counts in the highland Mubwindi swamp of Bwindi, I was very fortunate to see one active Grauer’s Broadbill nest, with young chicks. Given the biological diversity that exists in this incredible forest and its ecological importance, it is shocking how little we know about the birds that inhabit it. My educational background is in Microbiology but I changed career paths because I wanted to do applied conservation research. As I was warned would be the case by every conservation biologist and wildlife ecologist I spoke with for advice, the potential and actual impact of my work feels at times, perhaps most times, discouragingly small. E. B. White wrote, “I arise in the morning torn between a desire to improve (or save) the world and a desire to enjoy (or savor) the world. This makes it hard to plan the day.” Switching careers to wildlife ecology and conservation, was one an attempt to alleviate the struggle between these desires, to merge them into one. I cannot say that I have accomplished this goal. However, waking up in a wonderful place like Bwindi, so privileged to hear and observe this special little bird that we know so little about, it is impossible not to be moved by the beauty of this world and feel satisfied with the savoring alone. Elise Morton is a Ph.D. student in the School of Natural Resources and Environment and Wildlife Ecology and Conservation at the University of Florida (http://www.wec.ufl.edu/faculty/olim/olilabs.html#Elise). She is co-advised by Professors Madan K. Oli and Scott K. Robinson. Her research is focused on spatial and temporal patterns of avian diversity along elevation and disturbance gradients in tropical montane forests. Beauchamp, G. 2004. Reduced flocking by birds on islands with relaxed predation. Proceedings of the Royal Society of London, Series B: Biological Sciences 271: 1039–1042. Bruce, M.D. 2018. Grauer's Broadbill (Pseudocalyptomena graueri). In: del Hoyo, J., Elliott, A., Sargatal, J., Christie, D.A. & de Juana, E. (eds.). Handbook of the Birds of the World Alive. Lynx Edicions, Barcelona. (retrieved from https://www.hbw.com/node/56351 on 22 January 2018). BirdLife International. 2016. Pseudocalyptomena graueri. The IUCN Red List of Threatened Species 2016: e.T22698719A93699841. Carr, J., Outhwaite, W., Goodman, G., Oldfield, T. & Foden, W. 2013. Vital but vulnerable: Climate change vulnerability and human use of wildlife in Africa’s Albertine Rift. IUCN. Chapin, R.T. 1978. Brief accounts of some central African birds based on the journals of James Chapin. Rev. Zool. Afr. 92: 805–836. Colwell, R.K., Brehm, G., Cardelús, C.L., Gilman, A.C. & Longino, J.T. (2008). Global warming, elevational range shifts, and lowland biotic attrition in the wet tropics. Science 322: 258–261. Darrah, A.J. & Smith, K.G. 2014. Ecological and behavioral correlates of individual flocking propensity of a tropical songbird. Behavioral Ecology 25: 1064–1072. del Hoyo, J., Elliott, A. and Sargatal, J. 2003. Handbook of the Birds of the World. Vol.8: Broadbills to Tapaculos. Lynx Edicions, Barcelona. Friedmann, H. 1970. The status and habits of Grauer's Broadbill in Uganda (Aves: Eurylaimidae). Contrib. Sci. Los Angeles Co. Mus. 176: 1–4. Jankowski, J.E., Londoño, G.A., Robinson, S.K. & Chappell, M.A. 2013. Exploring the role of physiology and biotic interactions in determining elevational ranges of tropical animals. Ecography 36: 1–12. Janzen, D.H. 1967. Why mountain passes are higher in the tropics. The American Naturalist 101: 233–249. Lowe, P.R. 1931. On the anatomy of Pseudocalyptomena and the occurrence of broadbills (Eurylaimidae) in Africa. Proc. Zool. Soc. London 1931: 445–461. Lindsell, J.A. 2001. A breeding record and behavioural observation of African Green Broadbill Pseudocalyptomena graueri in south-western Uganda. Scopus 22: 68–70. MacArthur, R.H. & MacArthur, J.W. 1961. On bird species diversity. Ecology, 42, 594–598. McCain, C.M. 2009. Vertebrate range sizes indicate that mountains may be ‘higher’ in the tropics. Ecology letters, 12: 550–560. Phillipps, P. G. & Seimon, A. 2010. Potential climate change impacts in conservation landscapes of the Albertine Rift. WCS Albertine Rift Climate Assessment. whitepaper report. Plumptre, A.J., Davenport, T.R.B., Behangana, M., Kityo, R., Eilu, G., Ssegawa, P., Ewango, C., Meirte, D., Kahindo, C., Herremans, M., Peterhans, J.K., Pilgrim, J.D., Wilson, M., Languy, M. & Moyer, D. 2007. The biodiversity of the Albertine Rift. Biol. Conserv. 134: 178–194. Rahbek, C. 1995. The elevational gradient of species richness: a uniform pattern? Ecography 18: 200–205. Rockefeller, J.S. & Murphy, C.B.G. 1933. The rediscovery of Pseudocalyptomena. Auk 50: 23–29. Terborgh, J. (1977). Bird species diversity on an Andean elevational gradient. Ecology 58: 1007–1019. Terborgh, J. 1990. Mixed flocks and polyspecific associations: costs and benefits of mixed groups to birds and monkeys. American Journal of Primatology 21: 87–100. Wilson, J.R. & Catsis, M.C. 1990. A preliminary survey of the forest of the 'Itombwe' mountains and the Kahuzi-Biega National Park extension, east Zaire, July-September 1989. Unpublished report for the World Wide Fund for Nature, London.